Having stumped up what by most standards is a sizeable amount of money, the IMF assumes it should have a say in what Macri’s government does with it. The US$57 billion the International Monetary Fund (IMF) is lending to Mauricio Macri’s government may be chickenfeed for the likes of Jeff Bezos, Bill Gates and Mark Zuckerberg – men whose companies are beginning to measure their worth in trillions – but for a flat-broke country such as Argentina the money could make all the difference between keeping things more or less as they are for a while before finally revving up and a rapid slide into African-style poverty. Hard as it evidently is for many to stomach, were it not for the willingness of Christine Lagarde and her advisors to give Macri another chance, large numbers of people who – though far from well-off – still manage to make ends meet, could soon find themselves reduced to beggary, as have been so many of their counterparts in Venezuela. Having stumped up what by most standards is a sizeable amount of money, the IMF assumes it should have a say in what Macri’s government does with it. That, it seems, is one reason why Luis Caputo – who wanted to handle things his way and, in any event, weeks earlier had told his friends the job was not for him – suddenly left his post as governor of the Central Bank. He did so at a most inconvenient moment, what with Macri in New York, where he was trying to convince influential sceptics that despite appearances Argentina was a going concern, and back home belligerent trade unionists were staging yet another general strike, but that tends to be how things are done down here. In any event, as was to be expected, the alleged role of the IMF in Caputo’s departure and his replacement by Guido Sandleris was immediately exploited by nationalists and leftists who accused Macri of behaving like a colonial governor beholden to Mme Lagarde. Those who think that way are not entirely wrong. There can be little doubt that the people running Argentina have handed over a bit of sovereignty in exchange for money which they desperately need, but it so happens that all countries, even the United States, now and then have to adapt to international circumstances. The choice currently facing Argentina is not between untrammelled independence on the one hand and servile subordination to tight-fisted imperialists on the other, but between acquiring the means to repair a ramshackle economy while there is still time to do something and allowing it to sink even deeper into the mire. When thanks to the “quantitative easing” splurge that followed the implosion of Lehman Brothers cheap money was freely available, many assumed that the IMF has been rendered obsolete. From then on, optimists said, the markets would ensure that wayward countries would quickly come to their senses. From the point of view of tough-minded ideologues, that would be far better than the previous arrangement in which political considerations had to be taken into account, with the IMF negotiating with untrustworthy characters who sooner or later would default on their debts, but from that of tens of millions of individuals who are unable to influence economic policy, leaving everything in the hands of financiers who are interested only in making a profit would mean disaster. 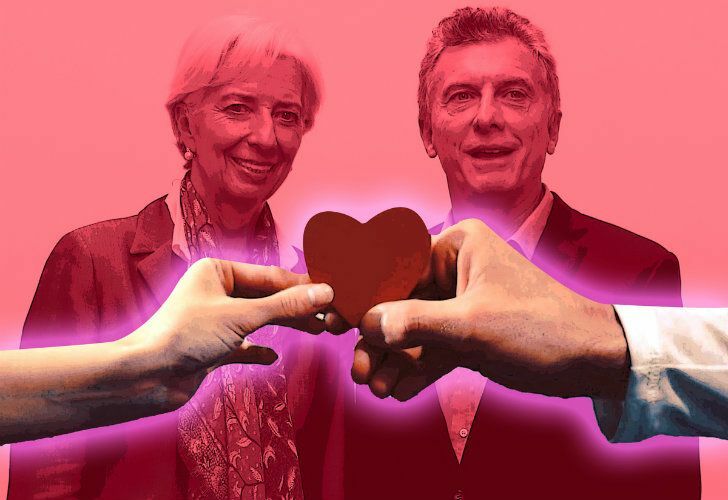 Foes of the IMF – of whom there are more in Argentina than in most other places – say the organism is evil because its loans are always accompanied by unwelcome conditions which are incompatible with national sovereignty. That is true enough, but it is not that hard to imagine what would happen were it not the case; politicians and their cronies in countries such as Argentina would merely pocket the money and carry on as before, blaming the IMF for all the problems they would encounter. Macri, Nicolás Dujovne and the rest of them may be perfectly sincere when they insist that the IMF is only backing the economic programme they drew up without asking foreigners for advice, but they must be aware that in the months to come they will be sorely tempted to make it less rigorous. When this happens, warning critics that the IMF watchdogs are glowering at them, baring their teeth and threatening to withhold the money the country needs should help keep them on the straight and narrow. Were there easier alternatives, straying from the path the people in charge of the economy have set themselves would not matter that much, but given the country’s record, letting up would in all likelihood prove disastrous. Over the years, dozens of what at first sight seemed to be promising economic programmes came to nothing because the governments responsible for them decided that it would be better to let a hard-pressed population enjoy a breather – Raúl Alfonsín used to say as much – and ensure the government could recoup some of its political losses. Macri swears he will not allow this to happen on his watch; rightly or wrongly, the IMF has taken him at his word. For the last couple of years, official spokespeople have been reminding us that for too long, 70 or 80 years, Argentina has lived far beyond her means and that this has to stop. Belt-tightening is clearly in order, but few think their own should be among those that get pulled in several notches. The government would like to see politicians, union bosses, judges and other members of the judiciary (which here includes men and women who perform quite humble tasks) set an example, but as they are all more than able to fight their corner, they are unlikely to suffer much. It is also understood that forcing businessmen to bear the brunt of austerity would be counterproductive as it will be up to them to drag the country out of the swamp into which generations of populists of one kind or another happily led it. It would therefore seem that, once again, people who are already hard up will be hurt the most by what is bound to happen before the economy finally starts recovering from its many self-inflicted woes. Just how all this will work out is impossible to say. The ongoing anticorruption campaign is making many people who would not be averse to a spot of ‘revolutionary’ violence increasingly nervous. Given the alternatives, let us hope that on this occasion Macri and the IMF have got it right, but it will be a close-run thing.